Everywhere you look, eggs are there! They’re in our baked goods and in mayonnaise. You can find eggs in pasta and even in marshmallows. What would we do without eggs? Eggs have long been known as one of the most nutritionally sound foods. They’re packed with protein, vitamin A, D and B12, and are even a source of iron. Let’s crack open an egg and see what’s inside, then compare the common chicken egg to a few others. Of course you know that the nutritional value of an egg is going to depend a lot on the way you prepare said egg. A fried egg isn’t as “good for you” as, say, one that’s been hard boiled. But you’ll still find the same basic nutrients in an egg, no matter how it’s prepared. 5 grams of fat. This includes 1.6 grams of saturated fats, .7 grams of polyunsaturated fats and 2 grams of monounsaturated fat. 187 milligrams of cholesterol, which accounts for a full 87% of a 2,000 calorie diet. We’ll talk about that in a minute. 62 grams of sodium. Compare this to a cup of chopped carrots, which contains 88 grams. Eggs are very low in carbs; each large egg contains just .6 grams of carbohydrates. That’s not all, though. The nutrients you’ll get from a large egg also include lutein and zeaxanthin. These are also found in your leafy green veggies, and are super for your eye health. Eggs also contain choline. Choline is good for nerve and cell health, and is thought to be good for brain function. There are a ton of reasons to choose eggs, both as a healthy snack and in cooking. But the most frequently cited is the protein content in eggs. Now you see why the protein in eggs is such a hot selling point. You’ve probably heard of bodybuilders drinking raw eggs they’ve put through the blender. This provides a quick boost of pre- or post-workout protein, and it’s inexpensive, too. You can take advantage of the protein in eggs, too. If you choose to consume raw eggs, be sure that they’re pasteurized. 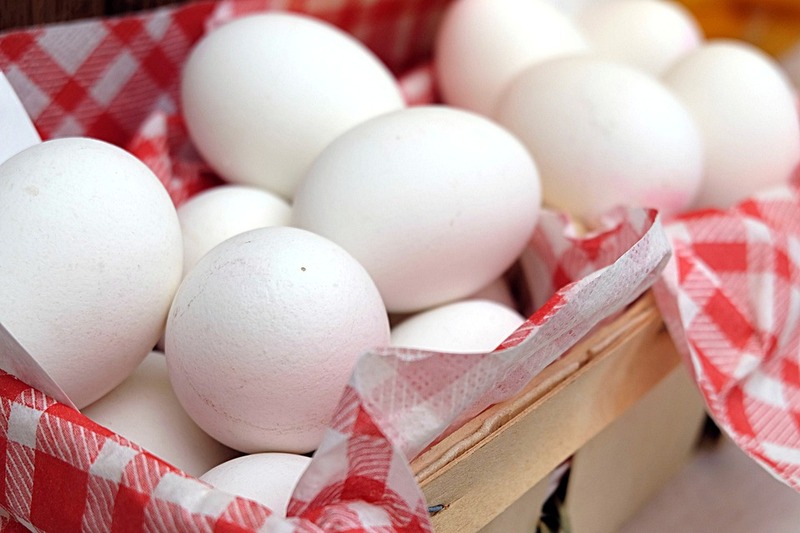 Raw eggs which are not pasteurized carry the risk of salmonella, a very dangerous bacteria. Here’s what may surprise you: eating raw eggs may actually decrease your body’s absorption of protein. As it would turn out, those athletes would be better off eating a cooked egg, and absorbing 90% of its protein. The human body only absorbs around 50% of the protein in a raw egg. Who knew?! Bodybuilding aside, eggs are a great way to get a healthy dose of protein when you’re reaching for a snack. That doesn’t just apply to chicken eggs, either. A duck egg, while larger than a chicken egg, contains almost 9 grams of protein. One of the most protein-rich eggs, believe it or not, is the quail egg. The average quail egg is only about 9 grams – they’re tiny. But one egg has 1.2 grams of protein. Of course, you’ll need to eat quite a few to feel as full. The calories in one large egg are nearly negligible when you’re speaking of cooking. But you’ve probably heard of several substitutions you can make, particularly in baking, for eggs. For a while, eggs got a bad reputation for causing health-related cholesterol issues. As a result, many people started seeking substitutes. If you’re allergic to eggs, of course, a substitute is appropriate. For recipes which use eggs as a binder, like brownies and drop cookies, you can substitute applesauce or banana. Gelatin will also work. But let’s see how the calories in one egg stack up against these substitutes. Is it worth it? You already know that one egg has around 78 calories. That same egg can be substituted for ½ of a banana in some recipes. But one half of a banana has around 60 calories, so the caloric savings doesn’t amount to much. One egg can also be substituted with 1/4 cup of applesauce. If you choose to use sweetened applesauce, that ¼ cup will amount to around 42 calories. If you use unsweetened, you will only be adding 25 calories to your recipe. In that case, it may benefit you to use applesauce. The calories in one egg are much higher. It doesn’t matter too much how you use your eggs. The nutritional value will be the same. The exception to this, of course, is the protein absorption in those raw eggs we talked about. Boiled egg nutrition varies very little from the nutrition in a poached or a fried egg. You’ll see the same amount of protein, number of calories, level of sodium and cholesterol content no matter how you eat your egg. Noted above, you’ll see that the larger the egg, the more protein you’ll consume. But keep in mind that the larger the egg, the more sodium and cholesterol you’ll eat, as well. 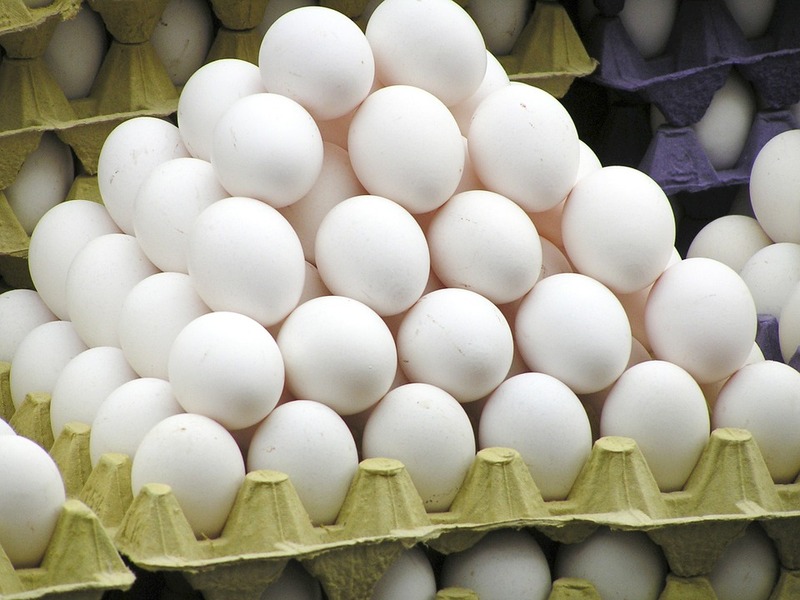 It’s generally agreed that the large eggs are the best balance of protein and other nutrients. Because of the cholesterol panic, many people chose to use egg whites instead of whole, fresh eggs. Egg whites come in cartons or bottles, and don’t contain the cholesterol that egg yolks do. One egg yolk has about 2.7 grams of protein, as well as 55 calories and 4.5 grams of fat. There is no cholesterol in an egg white. 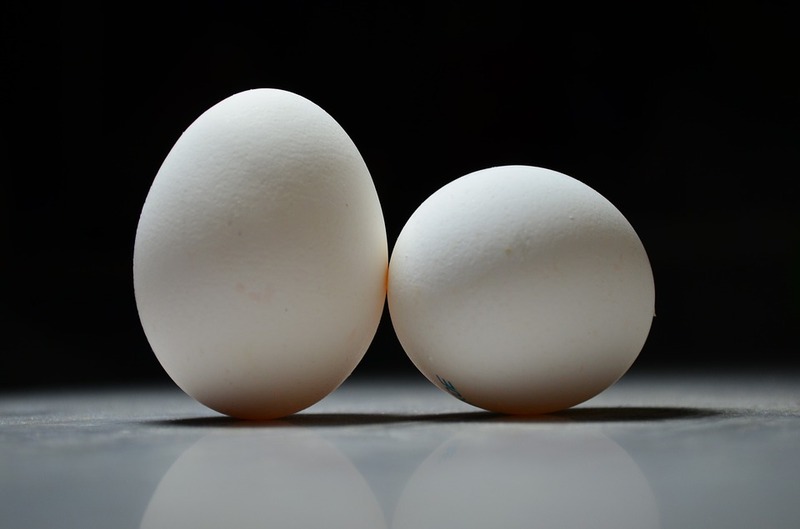 The difference between egg white and egg yok nutrition isn’t just cholesterol. It’s true that egg yolks contain all of the cholesterol in the egg, as much as 184 milligrams, it’s also the part of the egg with the “good stuff,” too. In the egg yolk you’ll find Vitamins A, E, D and B vitamins. This is also where you’ll find folate, a majority of the calcium and almost half the egg’s protein.